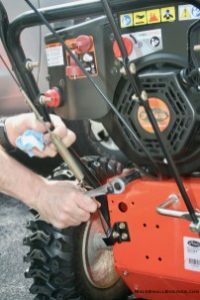 It is time to complete your snow thrower end of season maintenance if you have not already checked your machine. No one wants to do this kind of work in the cold of winter. Although you really do not want to think about winter it is really just a few months away at the time of writing this post. It is time to get your equipment tuned up and ready. Over the years we have found that regularly maintaining your snow thrower will add many years to its life and possibly to yours as well. It can be quite frustrating to find that your snow thrower will not start on the first day that snow falls. Your snow thrower will run better, smoother and at full power with new spark plugs, properly tension-ed belts and fresh engine oil. Clean fresh gasoline can help as well. We put together a checklist that should be part of your standard review for end of season maintenance or preparation for the coming season. Don’t procrastinate, do it now and get your snow thrower ready for the coming season. For more information about repairs and maintenance for your snow thrower, click here.